Using 0.12.4 and basically redoing the Original Story. I'm a noob at this and are just trying functions. 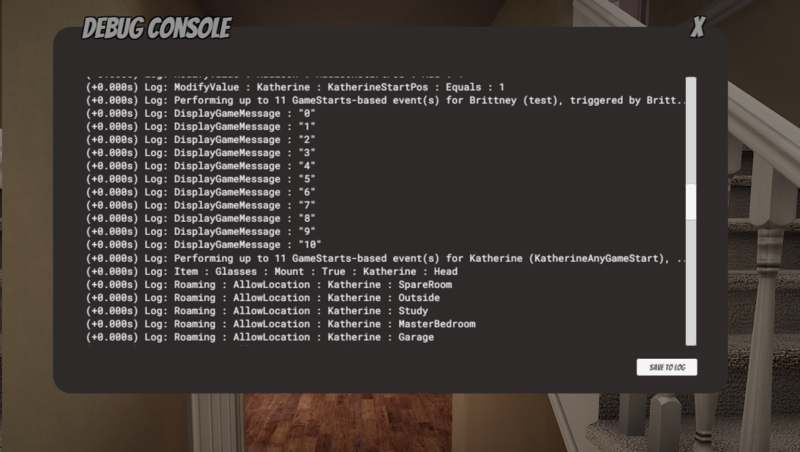 I've added an Event Trigger for Brittney, right now it only contains a DisplayGameMessage (When: never). When I try to trigger it from elsewhere it doesn't show up in the list together with the events that came with the original story. Also, what does "Order" do in a sequece of Game Events? Are they not for executing them in that order? Everything executes simultaneously for me. Would have to see what you did with the Event Trigger. Did you use a unique name? How did you set this copy of the Original Story up? Order does not mean they fire at different times. In most cases this will be a cosmetic, self-organization tool. But when events get queued up, (most notably in Event Triggers), they DO fire in their sort order as defined in the CSC. This can be important if you want to set a value to say, 1, and then know for certain that an event later in that Event Trigger will execute AFTER the value is set to 1, even if your timing/delay is tight. You can see this for yourself by defining 10 events, like I have here, each with zero delay. The order in this shot shows that event with sortOrder 0 executed "first", followed by 1, 2, and so on. Hi and thanks for the reply. Now I get how Order works. and then changed Story Name in the story prefab and characters prefab. Then I start with StoryCreator - Load Me First (Double Click).unity and navigate to the MyStory folder and edit those. Attached 2 pics on how the Event Trigger looks and that it doesn't show in the list. You shouldn't need to copy anything. Either in Unity, or in Windows File Explorer. The Import and Export functionality built into the CSC's Story objects are what you should be using. Import the Original Story right from the folder where it is stored, i.e. something like C:\Users\YOUR NAME\Documents\Eek\House Party\Mods\Stories\Original Story, and it will load in the CSC. Then, either export immediately to create your base "working copy", or start making changes immediately and export to a new folder whenever you're ready. This is really hurting my head. I can open up a story cube and then import a story from C:\Users\YOUR NAME\Documents\Eek\House Party\Mods\Stories\Original Story. But that only gets me the story, not any characters when I export it to a different folder. Sure, I can copy in the .character files to that folder, but how do I even edit them later? Everything except the Event trigger-thing works the way I've been doing it. Rename story name property for each of character files to match name of the story. Then import the story, and it will populate matching character files. Forget it, its working now. I re-downloaded CSC, created a simple event trigger and exported the Original Story again. Now it works. I must've screwed the original files somehow.